For some reason, I have an occasional need to make a dish all in one pot. On a gastronomical level, it just seems that a traditional one-pot recipe is fully tested and “evolved”, so it is likely to be good. On a practical level, it means less clean up. Either way, one-pot cooking is a good way to go and you will see a lot of it at Putney Farm. As for the soup, we have been working on bean recipes and whether to soak the beans or not. This is a recipe that will work either way, and it is very good. We still prefer to soak the beans. We just soak them in the morning and they will be ready for dinner. But in the notes, we provide a no-soak method. The smoked ham shank gives a deep, smoky flavor and the addition of kale makes it a “complete” meal. The big surprise in this recipe is how little seasoning is needed to develop flavor in the soup. The bones in the smoked ham shank provide a lot of flavor in a relatively short time, and we suggest you season near the end of the cooking time to adjust flavor. We serve the soup with toasted bread or, in this case, cornbread. We also like a dash of spice from Tabasco or, even better, Sriracha. – We suggest you soak the beans but if you do not have time, simply add the beans with the water and cook the full 2 hours, or until tender. – We also salt the beans when we soak them, this is often a controversial step, omit if you like. – For a creamier consistency in the soup, a few minutes before you serve crush a few of the beans against the side of the pot and stir. Repeat until you get the consistency you want. – Like many soups, this will taste even better the second day. Make the full recipe and enjoy the leftovers. 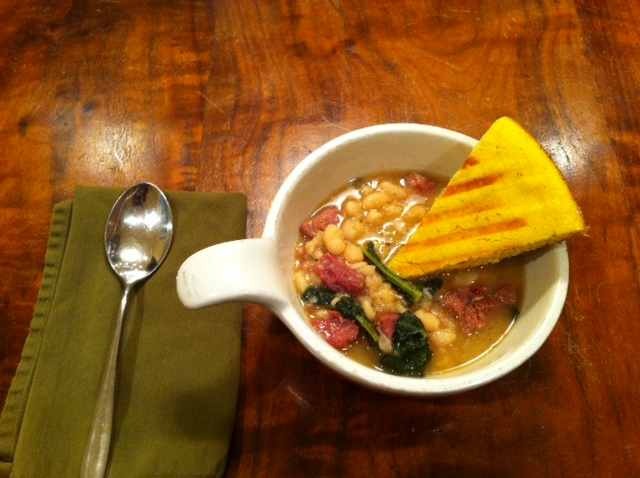 What you get: An easy, flavorful bean soup that is a “complete” meal. What you need: No special equipment required. A large heavy pot or Dutch oven will be helpful. But any large pot can be used. How Long? All day, if you count the soaking time for the beans. 2 – 2.5 hours of active cooking time. This can be a weeknight dish (if you hustle) and is a very easy assembly with limited clean up. If soaking beans, place beans in a large bowl or container with 2 quarts of water. Optional: add 1 tablespoon of salt. Soak for at least 8 hours. Place a large dutch oven or pot on the stove over medium heat. Once heated, add the bacon fat or oil. Add the ham shanks and lightly brown on all sides, about 5 minutes. Remove shanks to a plate. Add onion into pot and cook until soft, 5-10 minutes. Add 10 cups of water, ham shanks, bay leaves, rosemary, thyme and a few grinds of pepper to pot. (Note: if using dry beans add them now). Bring to a boil and then lower to a simmer. Let simmer for 1 hour. Skim any foam from the soup with a slotted spoon during this stage, if you like. After 1 hour, add soaked beans and simmer for another hour. Stir occasionally. 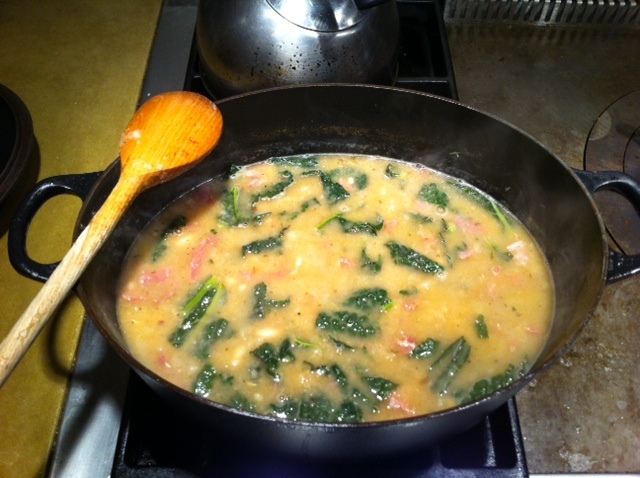 30 minutes after you add the beans, add the kale and stir. About 15 minutes before you serve, pull out ham shanks and let them cool. Once cool enough to handle, remove skin and bones from meat. Shred or chop ham into bite-sized pieces and return to the pot. Taste and season your broth. Check beans for doneness. Remove bay leaves. Serve. To err is human. For a putney to fail, well that is rare….a black swan event. Love the failure pics!